We hold regular monthly networking events for businesses, with speakers and knowledge exchanges. The Mid Morning Mid Month Meetup networking events gives a friendly and informal opportunity for organisations (and individuals if you want) to come and introduce yourself and make business relationships. We meet at 10am when the Venue at Storthes Hall Park opens and hold a round of speed networking, trying to aim to introduce you to at least half the people in the room in a friendly relaxed way. To ensure that we are able to maximise this experience, we have capped the number of people at the meetup, so to make sure you have a place, book your tickets now. 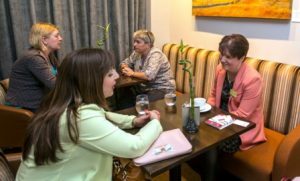 Not everyone wants to stand up in front of a room and introduce themselves, nor do others like to walk up and speak to strangers, so our Speed Networking sessions gives you the opportunity to have lots of one-on-one mini conversations – Speed Dating for Business if you like. We guarantee that you will meet at least half the people in the room. Most months we have an expert speaker, providing a member spot light or knowledge exchange – if this is something you are interested in please get in touch. You are then invited to informally network with us and if you wish to eat at this time, its possible for you to order on arrival. Advanced tickets cost £10 for non-members and £5 for members. Previously we were at the 315 in Lepton and The Woodman Inn in Thuderbridge and this is a video of what people had to say about our Meetup networking events. As part of your HD8 Network Membership you will receive the benefit of live networking meetings and events, as well as web-based resources such as a local directory, an events calendar, community pages and social media channels.